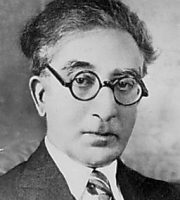 Constantine P. Cavafy was an ethnic greek poet who lived in Alexandria and worked as a journalist and civil servant. He wrote 154 poems; dozens more remained incomplete or in sketch form. During his life, he consistently refused to formally publish his work and preferred to share them through local newspapers and magazines, or even print them out himself and give then away to anyone interested. Read here his best poems selected from his complete poetry works. His most important poetry was written after his fortieth birthday and officially published two years after his death. His work was internationally recognised, as several of them were translated in other languages.